Can a Felon Become a Dentist? Often, felons must look at different career path following incarceration, but there are resources available. Moving on might include returning to school for additional education. Some felons might consider a career in healthcare which could include working as a dentist. 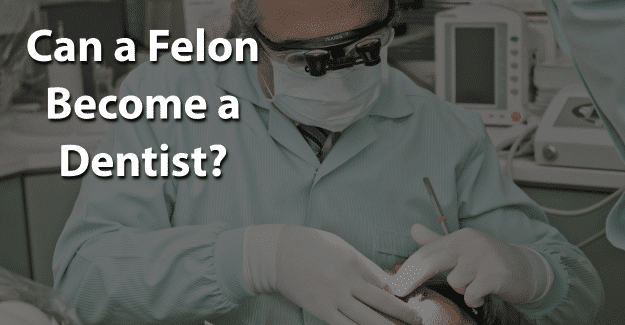 This blog post will address the issue of whether or not a felon can become a dentist. What Education/Training Does a Dentist Need? A dentist deals with various aspects of oral healthcare which typically includes regular checkups, teeth cleanings, and filling cavities. A dentist receives training in graduate school, obtaining a Doctor of Dental Surgery (DDS) or a Doctor of Dental Medicine (DDM). A dentist must be licensed to practice in his or her state. A program must be accredited by the American Dental Association Commission on Dental Accreditation (ADACDA), and a candidate must pass a written and clinical exam. It typically takes four years to complete dental school. All dental schools require applicants to have taken a number of science classes before admission, including biology and chemistry. An applicant to dental school typically takes the Dental Admission Test which will be considered along with grades, interviews, and recommendations. There are approximately 60 accredited dental school programs governed by the Commission on Dental Accreditation. The U.S. Bureau of Labor Statistics states that there are approximately 153,500 practicing dentists in the United States. The median annual wage for dentists in 2017 was $158,120. This is the income at which half of dentists earn more than that amount and half earn less. Earnings will vary according to the dentist’s location, specialty, and level of experience. Area of the country also makes a difference, with dentists in the North and along the East or West coast earning more than those practicing elsewhere. Dentistry is expected to grow approximately 19% from 2016 to 2026. Demand for dental services will increase due to the aging population and increased need for ongoing dental issues. An investigation will then be conducted by the State Board of Dental Examiners. All criminal convictions or deferred orders, prosecution, or adjudication must be reported to the state board. This includes offenses under state or federal law, or the Uniform Code of Military Justice. Expunged or sealed offenses don’t need to be disclosed to the state board. Failure to reveal an offense, arrest, ticket, or citation that hasn’t been expunged or sealed will lead to disciplinary action and rejection of an application. Nondisclosure of relevant offenses raises questions related to truthfulness and character. A criminal record will impact a candidate’s ability to obtain a dental license. The type of crime committed by the person seeking a license is a factor. Any crime involving fraud will make it extremely unlikely for the candidate to be approved for licensure. If the conviction for fraud came from a professional practice, there is no reasonable possibility of obtaining a dental license. Some drug offenses can also prevent someone from obtaining a dental license, especially if the crime involved prescription abuse. This may be either misusing the writing of prescriptions or of personally misusing prescriptions. Someone with a series of offenses or a recent conviction will have a much more difficult time obtaining a license. A misdemeanor typically doesn’t prevent a person from obtaining a dental license in most states. A felon can pursue any degree he or she wants. Approximately 60% of colleges consider criminal history in their admissions process, although there is no standard policy regarding a background check. Any felon that wants to get a degree in preparation for becoming a dentist can find a college that will accept him or her. It’s important to be honest in filling out an application when applying for dentistry school or licensing as a dentist. If a felony isn’t disclosed but is found on a background check, this constitutes fraud and is punishable. It’s a crime to falsify an application, which could result in being sent back to prison. Having his or her record expunged can give a felon the chance needed to begin with a clean record and succeed in becoming a dentist. Expunging a criminal record allows anyone to honestly state on an application that he or she has not been convicted of a crime. It’s a big challenge, but it might be worth it for a felon wanting to become a dentist. Having his or her record expunged and also documenting any training programs or additional education could make the essential difference in a felon succeeding in becoming a dentist. What do you think about this blog post? Have you or someone you know been in the situation of trying to become a dentist with a felony? What was that like for him or her, and how did he or she achieve success? Please tell us in the comments below.